Cate Luzio is the Founder and CEO of Luminary, the premier collaboration hub for women who are passionate about professional development and expanding their networks. Previously, she was the Executive Vice President and Global Head of Multinational Corporate Banking for HSBC, managing roughly $2 billion in revenue and teams in 55 countries. Cate also served as a Managing Director and Head of Multinational Corporate Banking at J.P. Morgan. She has received numerous recognitions including being named to the Most Powerful Women in Banking by American Banker multiple times. She is also a two-time recipient of the Financial Times and Heroes Global Diversity Champion. Cate has been featured in the Financial Times, Forbes, Wall Street Journal, CNBC, Fast Company, Bloomberg, USA Today, NowThis News, Politico, and Women’s Wear Daily. She holds a master’s degree in International Relations from Georgetown University and a bachelor’s in Political Science from the University of Maryland. 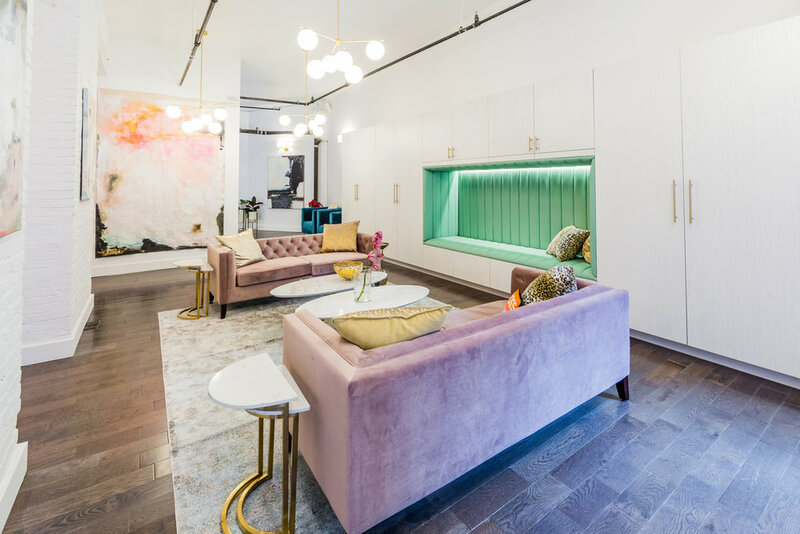 With over twenty years of leadership experience in financial services, Cate Luzio self-funded this massive 15,000 square foot meeting space in New York City for women, which includes a rooftop deck and two floors of open workspace, conference rooms, a fitness studio, beauty bar, a locker and lactation room, and much more. 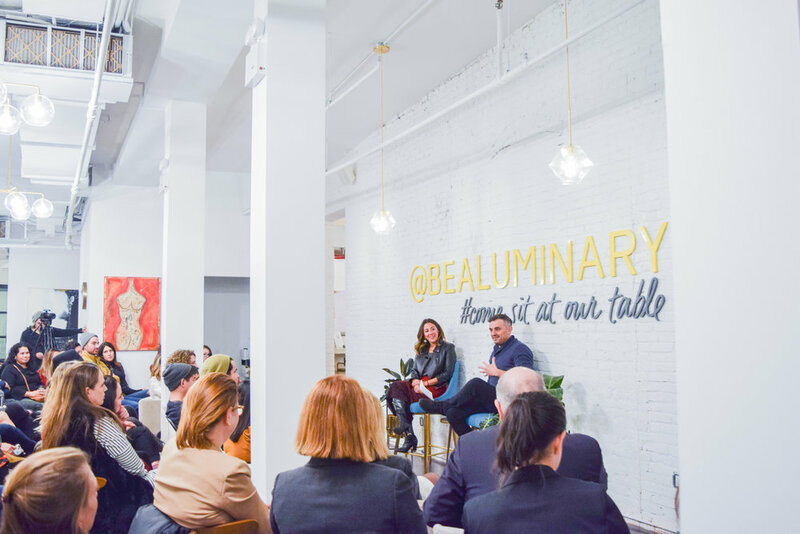 Luminary is the ultimate career advocate, offering members unparalleled programming from office hours with dynamic leaders to a pioneering speaker series. A longtime advocate for empowering women and girls, Cate also serves on the National Board for Girls Inc.
Fatima: Please tell us about your upbringing, and the factors that made you choose a career in the financial industry. Cate: It's my upbringing, as the daughter of two supportive working parents and the middle child in between two boisterous brothers, that made me who I am today. My dad always told me that no matter what happens even if you fall down, get up and brush yourself off—a helpful life tip that resonates beyond the soccer field, and I live it every day. I grew up in New Jersey always playing sports with boys, working hard and giving it my all—great preparation for the rigor of a banking career, although I never planned to go into banking. I received my master’s degree in international relations from Georgetown. After graduating, I was recruited by a bank to do international market strategy and development, and, admittedly, I didn’t know much about the banking industry and had no finance background. I sort of had to be convinced to take the job. Banking, in essence, chose me and sparked almost a two-decade career that I'm proud of. Fatima: You have had a very successful career. Could you pinpoint the things you have done differently that enabled these achievements? Cate: I don't know if my path is different—I did my job, worked really hard, took a lot of risks that turned out to be significant opportunities e.g. multiple international moves and roles, and proved myself every day. I was tapped for almost every job I have ever had, and took it head on. I always raise my hand to take on new projects and opportunities and go above and beyond. I also know that I can't take credit for it all—I had a supportive community of sponsors and mentors and, given my industry, most of them were men. Unfortunately, I didn't have many female mentors in banking and I learned a lot from the guys. That had a major impact on me, and as I accelerated my career, I felt I needed to pay it forward to support other women advancing their careers and development. I made it my personal commitment to stay involved in or lead the women's groups at the banks I worked in, and got involved externally as well. This was a significant part of the inspiration for starting Luminary—we need more women supporting women across industries at all levels. Fatima: How was it to be a woman in a predominantly male-dominated industry, could you speak to some of the gender-based discriminations you may have experienced? Cate: For a woman navigating predominantly male industries, there are so many politics at play, it's a challenging environment each day, and every decision matters and will be scrutinized. I learned how to manage discrimination and retaliation but it still hurts. I know what it's like to not make the same as my male counterpart, or be promoted as fast. I know that feeling when a client or colleague overlooks you or counts you out in a meeting. One example, when introducing his team to more senior management, one of my former managers would consistently flag that I didn't have a MBA. Every time without fail he would say that to undermine my experience or make me feel insecure. Over time, it did the opposite, but those subtle and not so subtle aggressions sting and stay with you. I would argue that they also make you stronger and you learn a ton of what NOT to do when you manage and develop people. Fatima: What triggered the choice to venture into a collaboration hub for women out of all the possibilities? Cate: Women need a space like this where they can invest in themselves, their relationships, and their careers. 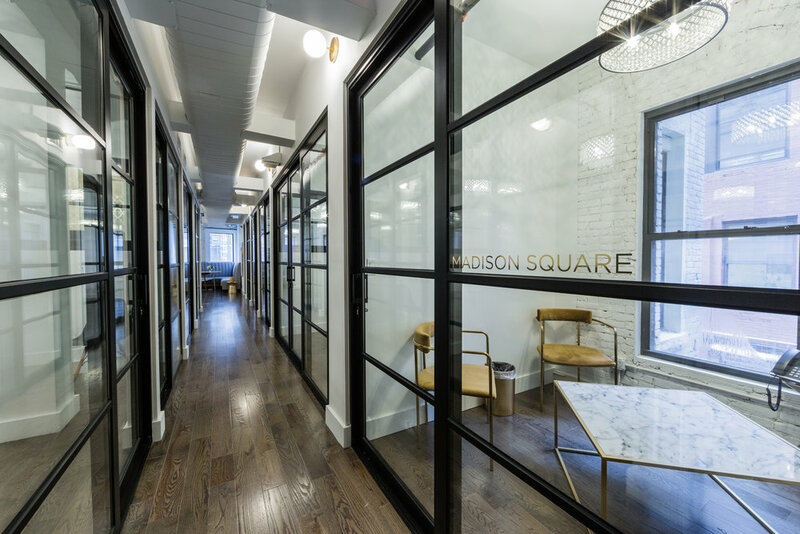 I recognized that professional women needed a physical meeting space that meets all of their needs from learning and development to co-working to wellness with the fitness studio to the beauty bar with Glam+Go for a little glam to meeting rooms and free wine on tap. This space was built by women for women who want a genuine community of their peers and is an ecosystem for supporting our businesses, careers, and lives. There are a lot of online communities and they are needed but there's so much power in having a place to go and feel welcome. We supplement the digital with physical. It’s one of the reasons our tagline is #ComeSitWithUs. Fatima: Women in finance are often perceived as cold and rigid. What could you tell us in response to this, and to change perceptions? Cate: I don't agree with that obviously (smiles). This is really where unconscious bias comes in. We seem to have to put a label on everything, especially women in business. It's destructive to characterize women, but our society does it. If you are strategic you are seen as calculating, if you are passionate then you are too emotional, if you’re assertive, you’re aggressive and so on. I am all of those things and I am not ashamed of that. I lead with authenticity and compassion, but am demanding and whether I was in finance or not, I would be that same person. It's so hard to always manage the perceptions of others. It's my hope that we stop judging each other and trying to fit people into boxes, and build a real community with each other. Let's get to know each other and lift each other up. Fatima: Throughout your 20-year career, what were some of your silent dreams and how have these been incorporated into Luminary? Cate: Being a woman in banking can be a lonely experience and I would have dreamed about having a place to go like Luminary. I once had a coach tell me “it’s lonely at the top but it’s even lonelier when you’re a woman.” I built most of my network in banking and was a bit siloed as that naturally happens when you’re in one industry for a long time. Since starting Luminary, I have met so many amazing people across so many industries and backgrounds, and I have learned so much from them. I also know what it's like to not feel as welcome or included, so I made diversity and inclusion my focus when building out the space. We don't have an application process for a reason—because we want to welcome ALL women. I wanted an open floor plan so that everyone can get to know each other, we are close to our members and we are deeply committed to helping them power through their to-do lists, meet their goals, and realize their dreams. And we don’t exclude men. They are welcome as guests, as colleagues, etc and participate in a number of our programs and events. 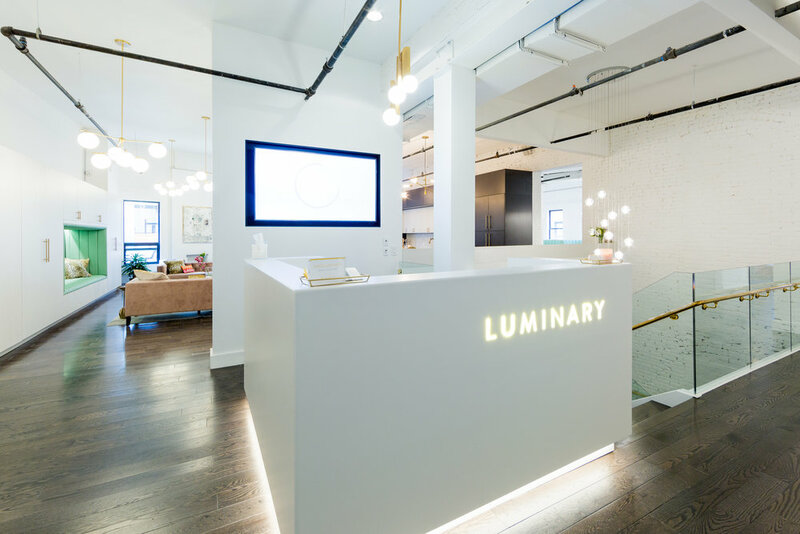 Fatima: Luminary is a self-funded massive collaboration space for women. We don't often hear "self-funded" and anything "massive" in the same sentence. What are your top three tips for women entrepreneurs? Cate: So true—but you have to go big or go home—if you can. I had a successful career, so was able to self-fund; not everyone can do that so I consider myself very lucky. I do think that my advice for women entrepreneurs is to follow their passion and put their all behind their ideas. It's okay to pivot and take risks. If I put my mind to something—I have to do it. Self-funding is a risky approach, and I’ve put my life savings into this business because I believe in it. I chose to self-fund, because I wanted to stick to the vision that I had, and quickly pivot if we want to do new things. If I’m asking women to commit time and money to join Luminary, I want to show them that I’m just as committed, and putting my money where my mouth is. By the way, we all have so many transferable skills that we tend to underestimate. If it doesn’t work, you can always go back. In the meantime, you’re developing so many new skills that you can apply later. Fatima: In terms of personal development, what habits have you proactively incorporated in your day-to-day that you are consistent with and swear by? Cate: Luminary is full of inspiring women with interesting careers, companies, and ideas and my favorite part of the day is being with our members. I am there every day and I sit in a spot where I can meet, interact and connect to each of them when they come in the door. I love listening to what they are working on, struggling with and collaborating with them to support their careers and goals, make new connections and in general see how we are changing lives. Personal development programming is core to everything we do at Luminary and I enjoy participating in our programming and learning new skills as well. I have a lot to learn and Luminary is a great place for me too! Fatima: With your journey and breadth of experience, what would you tell your 30-year-old self? Cate: I think I would tell myself to not take myself so seriously. It's okay to make mistakes. And never be afraid to speak up for others and yourself.